June was the deadliest month of the year 2011 in which American spy agency CIA has killed as many as 118 people in 12 drone attacks in Pakistan’s tribal area. This was revealed in a monthly report compiled by Conflict Monitoring Center, an Islamabad based independent research organization. During the month, US drones fired 35 missiles, which destroyed six houses, one madrassah and seven vehicles. According to CMC’s report, it was for the first time since the drone campaign started in 2004 that number of drone attacks in South Waziristan exceeded the number of attacks in North Waziristan. Eight out of twelve drone attacks were carried out in South Waziristan during June 2011. South Waziristan is known as a safe haven for anti-Pakistan Taliban whereas militants operating in North Waziristan generally target US and NATO forces across the border inside Afghanistan. The focus of CIA’s assassination campaign during the month was mostly on anti-Pakistan militants, which may be seen as an effort to deal with public criticism of the drone campaign. This shift in focus may prove ‘usefulness’ of drone attacks from Pakistan’s perspective. Pakistan has complaint in the past that CIA largely uses its superior technology only against anti-US militants often does not target anti-Pakistan militants. Past data shows that South Waziristan was never a frequent target of US predators. According to the yearly report of Conflict Monitoring Center, during the year 2010, CIA has carried out 132 attacks inside Pakistan and only nine of them were in South Waziristan. 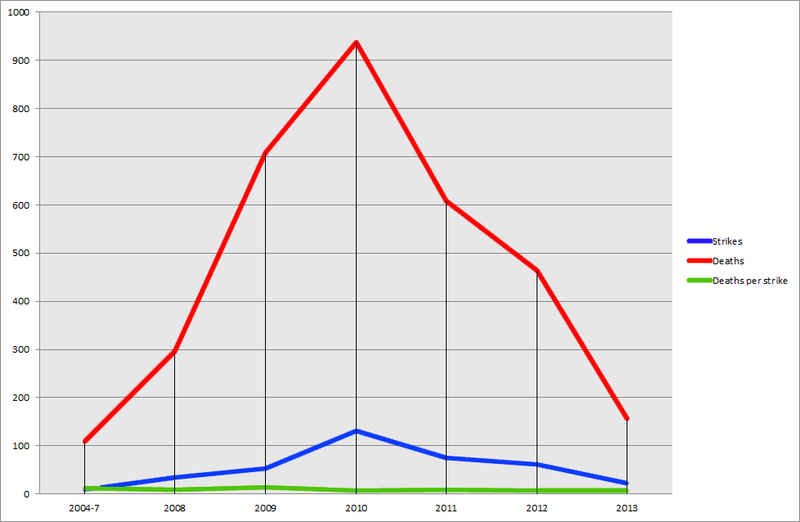 However, statistics of June 2011 show a clear shift in the focus. It is also noteworthy that in the pretext of US pressure on Pakistan to launch a military operation in North Waziristan it was expected that US will intensify its campaign in North Waziristan after Pakistan’s refusal to launch the operation but contrary to the expectations, it was South Waziristan, which was main target of drone attacks in June 2011. It is not clear whether this US will continue this pattern or it will refocus on North Waziristan in future. On June 20, Kurram Agency was hit twice by drones killing as many as 12 people. It was for the first time after two years that Kurram a drone attack in Kurram Agency was observed. In these two attacks, militants of Haqqani network were reportedly targeted who had relocated to the area. There was only one significant death reported during June 2011 that was Ilyas Kashmiri, founder and head of Al-Qaeda linked militant organization Harkatul Jihad Al-Islami 313 Brigade. He was a senior al-Qaeda member connected with the Soviet-Afghan war, the Kashmir conflict, and attacks against India, Pakistan, and the United States. In August 2010, the US and the United Nations designated him a terrorist. NBC News reported that United States officials had mentioned him as a possible successor to Osama bin Laden as head of al-Qaeda. He was also considered mastermind of attacks on Pakistan Navy’s Mehran Base and Army’s GHQ. On June 3, 2011, a US drone attack targeted a compound in the Ghwakhwa area of South Waziristan, a TTP stronghold. Nine militants, including Ilyas Kashmiri, were reportedly killed in the missile strike. Three other militants were badly injured in the attack. Local officials reported that the militants in the compound were all members of the Punjabi Taliban. Kashmiri had moved to Wana from Khyber Pakhtunkhwa 10 days earlier. A spokesman for the Tehrik-i-Taliban Pakistan stated that Kashmiri was alive and well. However, Lala Wazir, a spokesman for Mullah Nazir, a Taliban commander associated with the owner of the compound which was attacked, confirmed his death. Kashmiri’s death was also confirmed by an email from Harkat-ul-Jihad al-Islami and by an anonymous Pakistani security official. The U.S. defence department has so far declined to confirm Kashmiri’s death. However, a U.S. official said that it was more likely than not that Kashmiri is still alive, in spite of Interior Minister Rehman Malik’s assertion that he could ‘confirm 100 percent that he is dead’. On June 19th, the claim of his death was further backed after a senior US intelligence official in the Obama administration stated that Kashmiri was among five senior Al Qaeda leaders who had been killed in drone strikes in 2011. As usual, civilian deaths were overlooked by the security officials who released death tolls to the media representatives. There was no independent reporting observed during the month and media organizations only relied on body counts released by security officials. Despite controlled release of information, there was no consistency in the claims of security officials. However, a public demonstration on June 16 revealed that all those killed in a drone attack on June 15 were innocent civilians. On June 16, 2011, the enraged tribesmen blocked Bannu-Miramshah Road to protest killing of innocent people in US drone attacks in North Waziristan Agency on June 15, 2011. Hundreds of tribesmen placed the coffins of the four victims, killed in US drone attack, on the main road, and blocked it to all kinds of traffic. The protesting tribesmen were also chanting slogans against the US and Pakistan government. More than 2,000 tribesmen participated in the protest and funeral of the victims. The victims were laid to rest by the protesters after holding rally and blocking road. The US drones had fired four missiles at a moving vehicle on Thall-Razmak Road on June 15. Six people were killed in the strike. Earlier security officials had claimed that all those killed were militants but their claim was proven wrong when dead bodies of those killed were identified by their relatives. The residents of the area said that four of the victims, who belonged to Borakhel tribe, were identified. The identity of two other victims could not be established because there remains were not identifiable. Three victims, including a student, were from the same family. They were residents of Spelga village of North Waziristan. The fourth victim, Akram Shah, was a driver in WAPD, which is a government institution. As per their announcement, Some 1,200 tribesmen also staged a demonstration on June 20 in North Waziristan tribal region against the U.S. drone strikes and threatened to block the NATO supply line if the government failed to stop the attacks. All markets in major cities in the tribal area, Miranshah, Mir Ali and Razmak, were closed due to the protest. On June 5 and 6 A two-day sit-in was staged in Karachi by right wing Islamic political party Jamat-e-Islami to protest against drone attacks with a warning to the relevant authorities that supplies to Nato forces in Afghanistan would be blocked if drone attacks continued. Thousands of people carrying banners inscribed with anti-US slogans and party flags took part in the sit-in. The huge crowd comprising party workers, supporters, and trade union leaders was addressed by JI chief Syed Munawwar Hasan, Sindh and Karachi chapter chiefs of the party Asadullah Bhutto and Mohammad Husain Mehnati. On June 7 The lawyers in Masehra a northern city of Khyber Pakhtoonkhwa province took to the streets against the US drone attacks in the country. Holding banners and placards, the lawyers led by District Bar Association President Naseem Khan marched on various roads before reaching the district bar. The banners were inscribed with slogans against the United States and the government, demanding immediate halt to the US drone attacks in the tribal areas as innocent people were being killed in the strikes. On June 13, The Pakistan Tehreek-i-Insaf blocked Nato supplies by staging a two-hour protest sit-in in front of the Karachi Port Trust Gate No 17. Imran Khan’s Pakistan Tehreek-e-Insaf had also announced a sit-in on June 25 but it turned a protest against PPP government policies. Pakistan Sunni Tehreek a sectarian extremist organization has also protested against drone attacks in Lahore on June 6. June 2011 also witnessed highest number of drone attacks in 2011 at par with March 2011. Both the months saw 12 drone attacks each. However, number of subsequent deaths in June exceeded all months of 2011. In May 2011, CIA’s predators carried out nine drone attacks killing 62 people. It means the resultant fatalities in June have become almost double to fatalities of May 2011. During June 2010 the number of Drone Attack were only six, which had killed 50 people. It means a hundred percent increase in number of drone attacks and resultant fatalities in June 2011. As per the tally of Conflict Monitoring Center, US has carried out 50 drone attacks during first six months of the year and killed 371 people. This is almost equal to the statistics of first six months of year 2010. During first six months of last year, CIA has carried out 48 drone attacks in which 382 people were killed.